In this annual Drug Development & Delivery magazine report, some of the industry’s leading CDMOs talk about the innovations they are developing for next-generation patient care, and how many are making investments that are enabling them to offer more services under one roof. Almac is a full-service contract development and manufacturing organization that utilizes highly technical core teams capable of developing formulations and analytical methods in-house, then carrying them through to clinical trial material manufacturing, scale-up, commercial manufacturing, packaging, and stability testing. Last year, Almac expanded its GMP manufacturing capacity for solid oral dosage forms and is currently operating from two UK sites, which offer dedicated high-potency processing suites, Gerteis roller compactors, mini-tablets, and stick packs. Almac also established a non-GMP facility to accelerate the formulation development process and facilitate seamless transfer to its GMP facilities. She describes one client with a commercialized adult dosage form that needed a corresponding pediatric dosage form with an easy-to-use packaging format. Mini-tablets filled into stick packs were identified as the best presentation. She says Almac successfully optimized several equipment features: Punch tip concavity; ejection scraper design; ejection cam position; and punch and turret keyways. Also designed were 37-tip punches that allowed compression rates up to 550,000 minitablets per hour. “And, in conjunction with a third-party specialty vendor, the team successfully identified, installed, and qualified stick pack filling equipment that could operate at up to 80 cycles per minute,” says Ms. Young. As the market for complex products and biologics continues to grow, biopharmaceutical companies are working with CMO providers who take a more sophisticated approach to sterile dosage form development and manufacturing. AMRI offers formulation development, scale-up, and cGMP supply for liquid and lyophilized products, providing solutions for both simple and complex formulations. AMRI’s expertise in challenging formulations, processes, and approaches includes Tangential Flow Filtration (TFF), extrusion, microfluidization, as well as expertise with viscous products. “TFF requires advanced process knowledge with specific consideration of scale-up to ensure clean execution with complex formulations,” explains David Stevens, Senior Vice President, Head of Drug Product, AMRI. “In collaboration with a customer and TFF technology vendor, AMRI supported the successful transfer and scale-up of a peptide formulation, translating data derived from milliliter scale studies to final drug product. Through careful consideration of product and process critical parameters attributes, a bespoke, high-pressure, semi-automated skid was jointly designed enabling a single-step scale-up process with concomitant time and cost benefits.” Additionally, there is growing interest in assessing more complex liposomal or nanoparticulate products at early-stage development to address inherent formulation challenges. Mr. Stevens says the goal is not only to screen potential formulation options, but also for parallel assessment of manufacturing methods viable for scale-up and GMP batch manufacture. AMRI is working in collaboration with a customer, a vendor, and a local university to establish a robust development approach to manufacture liposomal formulations. Ascendia has positioned itself accordingly by hiring graduate-level scientists with broad backgrounds in new technology and investing significantly in new equipment to handle the broad needs of these programs. “There is tremendous creativity in our field, with numerous entrepreneurial companies looking to develop pharmaceutical products to address very specific unmet medical needs,” he says. 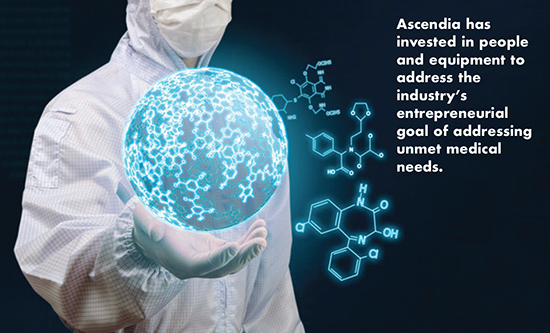 When Ascendia was first established in 2012, the company’s primary mission was to offer a complete suite of formulation capabilities for early-stage projects to improve a drug’s bioavailability. As these early-stage projects are often intended for proof-of-concept, the work needs to be done rapidly and within a set budget. In such cases, Ascendia offer a fixed-fee program with a defined set of deliverables. “Our clients can go from pre-formulation to in vivo proof-of-concept relatively quickly and with a known expense, which is beneficial for making efficient decisions on the viability of an early-stage drug program,” says Dr. Huang. There is great interest in specialized formulation platforms in support of both new drug applications and lifecycle management opportunities, including the 505 B2 pathways, whether it involves small molecules in simple solution vehicle preparations or complex macromolecules in nanoparticle carrier systems. As an outsourcing formulation development organization, Aztech implements risk management concepts and Quality-by-Design approaches in its protocols to provide a more focused and efficient pathway in formulation development. This, says Dr. Higuera, leads to more quality and robust formulation platforms, increases productivity, and establishes a template for future project opportunities. With continued interest to expedite drug development, the industry is taking more holistic approaches to evaluate novel excipients, such as new polymers and solubilizers, to meet unmet customer needs. Aiming to bring drugs to market faster, the pharma industry is finding more value in high functionality excipients either co-processed, or standalone as a new polymer/copolymer. “BASF offers technical know-how in the areas of solubilization, instant- and modified-release, soft gel, and skin delivery,” says Shaukat Ali, PhD, Technical Support Manager, Pharma Solutions, BASF Corporation. “BASF’s partnerships with CROs and CMOs and equipment manufacturers provide insights that allow us to stay ahead of emerging formulation challenges and share knowledge about excipients and their cross-functional uses in oral, parenteral or topical formulations. For example, with our expertise and technical resources in instant- and modified-release, we collaborate with industry to develop coatings, ODT, multi-particulate systems, and taste-masking ingredients for solid oral dosage forms. In the area of polymer chemistry, we are creating new excipients to overcome the challenges with poorly soluble molecules and improve solubility and bioavailability,” says Dr. Ali. BASF’s alliances with CROs and CMOs have fostered projects with small and large companies focused on traditional oral and topical formulations, as well as on biologics manufacturers and parenteral formulators. In addition to improving solubility, Dr. Ali says that excipients play an important role in the development of controlled-release dosages. “Life cycle management has been a subject of continued focus in the industry. For example, developing a once-a-day controlled-release dosage to improve patient compliance is a strategy to extend the life cycle of a drug,” says Dr. Ali. BASF is working with drug manufacturers by supporting their innovation with controlled-and modified-release polymers, peroxide-free binders, and taste-masking ingredients, among others. As a result, excipients like Kollidon SR and Kollicoat SR30D and enteric polymers, Kollicoat MAE 30 DP, 100P and 100-55 have been used in many approved drugs with modified-release characteristics. Others such as Kollicoat Smartseal 30DP have been used successfully for taste-masking of bitter APIs, and Kollicoat IR has become a standard for controlling the degradation of peroxide-sensitive APIs. In Baxter’s Bloomington, IN facility, approximately 80% of Baxter BioPharma Solutions’ projects involve biologics and the remaining are typically small molecules that require a solubility enhancer such as an organic co-solvent. 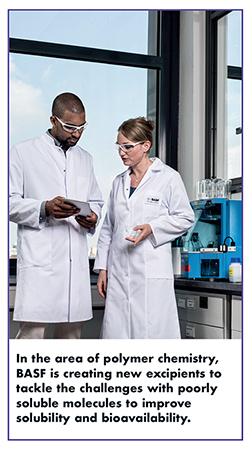 Baxter’s R&D team works with clients to help collaborate on their development needs. “We prefer early involvement from our colleagues in technical transfer and manufacturing, which helps ensure the formulation and process are developed with consideration of the performance at full-scale, and it also ensures that there is sufficient time to purchase new equipment that may be needed to support the project,” says Gregory A. Sacha, PhD, Senior Research Scientist at Baxter. 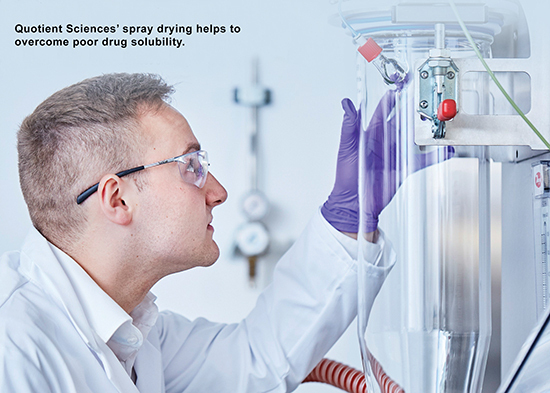 One of the biggest problems in the manufacturing of large-molecule therapeutic agents is the instability of these molecules in aqueous solution, and the need to freeze-dry the drug product to ensure an adequate shelf life. “Freeze-drying is time consuming and inefficient, and this problem has been exacerbated by the traditional trial-and-error approach to the establishment of suitable processing conditions,” says Steven L. Nail, PhD, Principal Scientist, Baxter. In this empirical approach, a set of process conditions that provide a pharmaceutically acceptable product is identified, followed by the establishment of “proven acceptable ranges” for process variables, such as shelf temperature and chamber pressure during primary drying. The problem with this approach, says Dr. Nail, is that it provides no information as to whether these process conditions are optimal (meaning that they allow the process to be carried out in the shortest time while still providing a pharmaceutically acceptable product). These edges of failure can be either associated with the product, which would carry a high risk of providing an unacceptable product, or with the equipment, as there is always a limit as to the maximum sublimation rate that a given freeze dryer can support. Poorly soluble small molecules remain prevalent in pipelines, and the need for bioavailability-enhancing formulations continues to rise. Properly addressing issues at an early stage of development can help prevent failures due to a lack of efficacy caused by poor bioavailability, when the dose is subsequently scaled. In recognition of the growing need to overcome solubility and bioavailability issues, Catalent acquired micronization and spray drying capabilities, and also developed its own facilities and expertise in hot melt extrusion (HME), and has continued to invest in lipid-based delivery. In April 2018, Catalent announced it will invest $5 million at its Somerset, NJ facility to focus the site on preclinical to clinical Phase 2b formulation, analytical, and manufacturing solutions for orally delivered small molecules. “The additional investment will enable greater speed, flexibility, formulation expertise, and capacity for early-phase development, and focused capabilities to meet the increased needs of virtual and small pharma companies,” says Ronak Savla, Scientific Affairs Manager, Catalent Pharma Solutions. This is especially critical to serve the needs of biologics companies. To that end, Catalent has acquired the experience and expertise of Cook Pharmica LLC’s Bloomington, IN-based business, and has also invested in Catalent’s Madison, WI, facility to accommodate two, 2,000 liter single-use bioreactor systems. This allows the site to support late-phase clinical and commercial production of up to 4,000-liter batches, and there has also been investment to expand its analytical and process development laboratories at the site. “These investments will strengthen Catalent’s position as a leader in biologics development and analytical services, as well as manufacturing and fill-finish,” says Dr. Savla. For example, Neftali Tosado, Director of Continuous Improvement and Technology, Catalent Pharma Solutions, describes how Catalent received a request to fill a unique softgel capsule with 40mg ± 0.9mg API in addition to keeping the existing range of 460-5,000mg with no adverse impact to current overall equipment effectiveness, changeover, throughput, cycle time, etc., and minimal or no regulatory impact. “At the time, it was virtually impossible to fill a softgel with a specific gravity of the paste-like material specified,” he says. Although the preliminary development was for softgels, the Catalent team determined that the pump technology was also suited for blow/fill/seal applications. CPL focuses on non-sterile liquid and topical semi-solid pharmaceutical products. With these dosage forms, CPL is seeing a trend towards smaller commercial batch sizes with an increasing number of formulations intended for orphan indications. Additionally, companies are incorporating poorly water-soluble APIs into formulations that require high solvent content. This creates a formulation challenge of providing sufficient solubility while ensuring good sensory characteristics for a high level of patient acceptability. To address both new development projects and commercial capacity, CPL recently installed innovative manufacturing and packaging equipment that provides flexibility for customers and new formulations. For product scale-up and commercial bulk manufacturing, twin XP Symex vessels with 1000L and 2000L working capacity support clinical and commercial batches 200kg through 2000kg in scalable matched vessels. And for the product packaging operation, CPL invested in two new serialization-ready filling/packaging lines: an XP-rated high-speed aluminum/laminate tube line and a high-speed XP bottle/capping line. “Each line has higher filling speeds to allow for more efficient product packaging while ensuring compliance with regulatory requirements” says Dr. Winters. “These lines will add additional capacity and flexibility to meet future demand, as well as support unique tube and bottle packaging formats. As a CDMO with backward integration in the design and production of functional excipients like EUDRAGIT® and RESOMER®, Evonik Health Care has been helping customers transform their APIs into high-performance medicines for many decades. In addition, the CDMO provides comprehensive support throughout the design, development, production, and scale-up of the finished dosage form. “This combination of products, drug delivery technologies, and value-added services helps customers reduce project complexity, accelerate speed to market, improve drug effectiveness, and strengthen global security of supply,” says Dr. Thomas Riermeier, Vice President, Head of Pharma Polymers & Services, Evonik Health Care. Over the last year, Evonik has seen strong demand for specialized parenteral dosage forms, such as injectable microparticles and lipid nanoparticles. Microsphere formulations can be precisely tuned to control drug release over several weeks or months, based upon the design and choice of polymer, the morphology of the particle, and the process parameters for manufacturing. Lipid nanoparticles have experienced a significant resurgence as well, and they are becoming the de-facto standard for the delivery of genetic-based drugs. 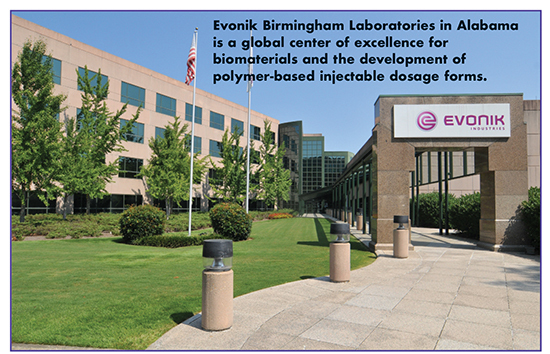 Evonik is also expanding its CDMO and excipient production capabilities in North America to meet growing demand for advanced formulations. This includes a new production facility for its RESOMER polymers, a custom-designed filling line for complex injectable products, and the doubling of its footprint in Vancouver to develop lipid nanoparticle products. In parallel, Evonik is expanding its CMO capabilities for API and advanced intermediates, with a focus on advanced technologies such as continuous processes, fermentation, mPEGs, and HPAPI. Exelead manufactures products in a completely sterile (aseptic) envelope as well as in non-aseptic environments because engineering controls have been built into the system downstream to remove any microorganisms that may contaminate the product. This is all done prior to filling into a vial by passing the finished bulk formulation through a sterilizing grade filter. However, if this form of filtration is used, the particle size is of extreme importance and must be controlled. If the LNPs are too large, they will not pass through the filter, and the product cannot be filled. “As experts in LNP formulation, we have experience in optimizing processes to control particle size to modify established formulation processes to produce aseptic, injectable drug products,” says Mr. Rigg. Halo Pharma has seen an increase in the number of pharmaceutical companies looking for ways to repurpose APIs through the development of fixed-dose combination products, says CEO Lee Karras. Halo is also experiencing more requests for pediatric dosage form development for branded product label expansions, as well as topical products in both the branded and generic spaces. In fact, the Generic Drug User Fee Act (GDUFA) is resulting in generics being approved in shorter periods of time, resulting in an increase in generic drug development. “Halo Pharma’s product development expertise, coupled with its proven international regulatory track record, has helped the company develop ongoing business relationships with the top-five global generic companies,” says Mr. Karras. Halo Pharma’s comprehensive and collaborative approach to outsourcing has generated success for clients with complex challenges. A recent example involved a tablet product that a sponsor had placed at another CDMO. The product was not able to meet its filed hardness specification, so the sponsor asked Halo to intervene. “There was a heightened sense of urgency around the product because there was no alternative available and patients needed the product,” he says. Halo Pharma’s formulation team, along with pilot plant operators, conducted a series of experiments to determine the cause of the drift in hardness. The issue was ultimately tied back to powder flow, which was modified by changing the way the powder was fed to the press, yet still staying within the filed regulatory requirements of the product. To support its capabilities around complex dosage forms, Halo Pharma uses complex manufacturing technologies, such as wurster fluid bed coating of beads, extrusion/spheronization, ion-exchange resin formulations, mini-tablet filled capsules, and granule and mini-tablet-filled sachets. 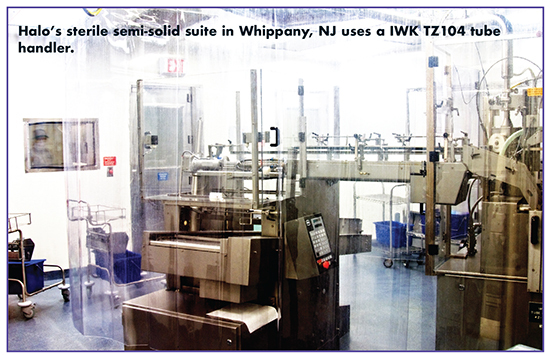 Halo’s sterile semi-solid suite in Whippany, NJ, uses a Krieger 600 MMD batch processor and IWKA TF 20 Robotic Tube Filler, and can manufacture bulk batches from 200 to 450kg, for up to 200,000kg, annually. Halo’s non-sterile semi-solid suites utilize a development and pilot-scale Ekato Unimix SRC-150 that can handle batch sizes ranging from 25kg-150kg. Using this equipment, Halo develops dermatology products such as creams, ointments, and gels. In addition, the production-scale equipment can handle commercial batch sizes up to 1,000kg. The Metrics Contract Services business model allows the company to accelerate timelines and deliver clinical trial materials quickly. In fact, Metrics Contract Services has structured itself to facilitate fast-track development by having scientists work in dedicated fast-track suites, conducting product development and manufacturing on a pilot scale outside GMP manufacturing, but with equipment scalable to GMP suites. Additionally, the company offers fast-track analytical testing – delivering same-day testing of prototypes to provide data to its scientists. In addition to speed, Metrics Contract Services is interested in delivering convenience. The parent company of Metrics Contract Services, Mayne Pharma, recently opened an $80 million, 126,000-sq-ft oral solid-dose commercial manufacturing facility in Greenville, NC. “The new facility positions Metrics Contract Services to offer development clients a comprehensive concept-to-commercialization solution in one contiguous location under one FDA site registration – delivering larger scale and increased capabilities for seamless scale-up, and reducing or eliminating the need for site transfers,” says Yogesh Sadhale, PhD, Associate Director of Pharmaceutical Development, Metrics Contract Services. And with commercial manufacturing housed in the new facility, Mayne Pharma’s former manufacturing facility is being repurposed to expand Metrics Contract Services and its pre-commercial product development capacity – creating 10-plus new processing rooms and laboratories. Scientists at Metrics initiated tablet reformulation studies, and evaluated a capsule formulation used in a previous Phase I clinical trial. Further reformulation trials revealed that there was likely some interaction between lactose and Crospovidone in the formulation, in addition to a possible effect of pressure, either compaction and/or compression. “We reformulated the tablet using microcrystalline cellulose and croscarmellose sodium, which resulted in a significant decrease in the impurity level,” he says. Additional work is ongoing to evaluate the effect of compaction/compression pressure and to optimize the dry granulation process to improve granule flow. Quotient Sciences’ business model integrates CDMO and CRO activities within one organization. This approach simplifies outsourcing supply chains, accelerates timelines, and makes drug development more cost-efficient, says Dr. Peter Scholes, Chief Operating Officer, Quotient Sciences. Once a new drug product is identified and developed, Quotient offers flexible and scalable clinical manufacturing for global patient trials. Clinical trial manufacturing can be highly personalized and tailored to meet the needs of the trial, based on patient criteria or recruitment rates. Dr. Scholes says this can be significant with oncology, orphan, or pediatric diseases. Quotient has invested in both capacity and capability, especially to support poor drug solubility and high potency. “We have full internal capabilities for working with all DCS compounds and we also work with technologies suited to improving the bioavailability of compounds with dissolution, as well as solubility-limited exposure.” For high potency, Quotient has purpose-built suites suitable for handling all molecule types. As far as organic expansion, Quotient recently completed the acquisition of two CDMOs: UK-based Pharmaterials and US-based QS Pharma, which Dr. Scholes says will strengthen Quotient’s service portfolio from preclinical formulation development through to commercial manufacturing. As an example of an early development program, Dr. Scholes describes a first-in-class antifungal treatment. The drug had low water solubility and utilization of an enabled formulation technology was essential to ensure sufficient oral bioavailability in early clinical studies. 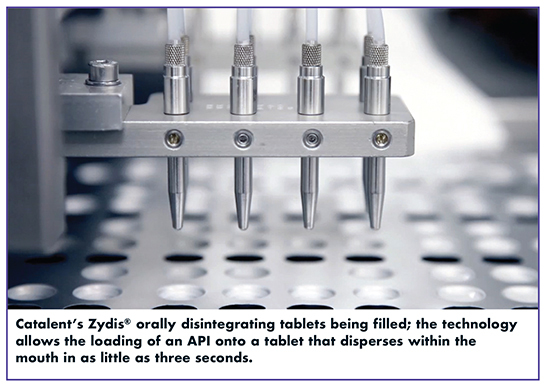 In this case study, an early development program was designed to rapidly initiate first-in-human (FIH) evaluation using a spray dispersion-in-bottle formulation before transitioning to a solid oral dosage, confirming tablet performance in healthy volunteers and scaling up the manufacturing process to support a Phase II clinical study in patients. “By integrated early development activities and applying a real-time drug product manufacturing approach, the FIH study was initiated within 12 weeks of initiating SDD process transfer,” he says. An immediate-release tablet was developed and evaluated in a bridging PK study demonstrating 101% relative bioavailability within 26 weeks of commencement of formulation development. The scale-up of the SDD tablet process and generation of data for inclusion in the regulatory filing to support the Phase II clinical program was completed within a further nine weeks. Overall, the entire early development program, including FIH trial, solid oral dosage form development, and provision of data to initiate a Phase II clinical program was completed in less than 13 months. Tablets and capsules remain UPM’s primary focus for meeting client needs in these areas, including specialty forms such as ODTs (oral disintegrating tablets), minitabs, immediate- and modified-release solutions, and neat API encapsulation. UPM also has extensive expertise in oral peptide development. Changes in 2016, including the implementation of the manufacturing quality assurance (MQA) initiative as well as the realignment of laboratories and specific capabilities, have ensured more efficient production and more consistent operations to achieve faster time to market, even for challenging APIs, explains Hulya Sahin, PhD, Senior Director Product Development, R&D, UPM. In addition, UPM’s R&D group works with a deliverables-driven system for scheduling, development, and production. “Although a smaller CDMO, UPM offers proof-of-concept services through clinical and commercial manufacturing support – but with the personalized, responsive service of a well-funded, family-owned organization that emphasizes customer service and satisfaction,” says Dr. Sahin. In the last five years, UPM has expanded its facilities from 40,000 sq ft to over 750,000 sq ft, and has grown its employee base from 65 to 265 while modernizing operations. Says Dr. Sahin: “We have greatly invested in capital improvements, including the construction of a state-of-the-art R&D feasibility lab with five processing rooms and scalable equipment that supports our clients from development to commercialization. 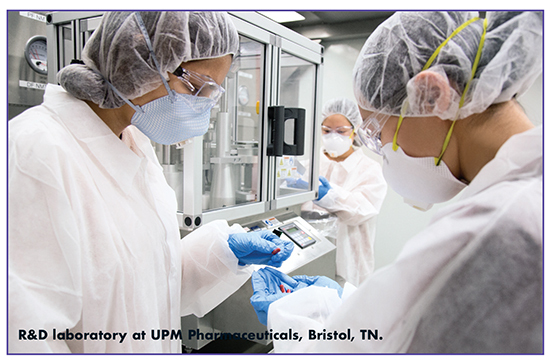 We have also added a low humidity suite and serialization capabilities.” In addition to the capital expenditures, UPM has hired development scientists with backgrounds in formulation development, including modified-release technologies for tablets and capsules, and process development, clinical supplies manufacture, and scale-up and technology transfer.